From a very recent find on Cerro Warihuyn, it has very different characteristics from the samples known so far. 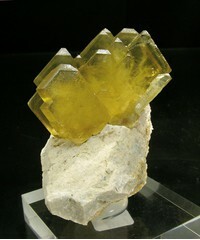 Parallel growths of tabular crystals with perfectly defined faces and edges and a deep yellow color. 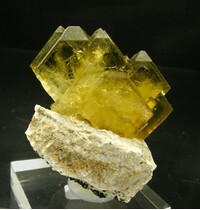 Very esthetic and aerial on the Dolomite matrix. ↑ 2850 m., Cerro Warihuyn, Miraflores, Huamalias, Huanuco, Peru.